Click here for 2010 reunion memories. 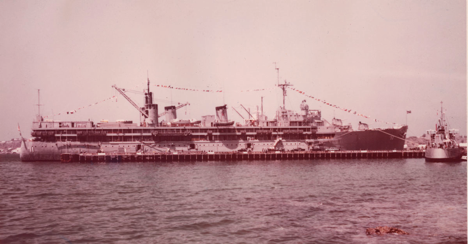 USS Fulton with Squadron Ten boats at State Pier. 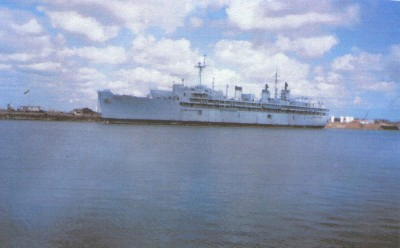 Last berth for the USS Fulton in Brownsville, Texas. 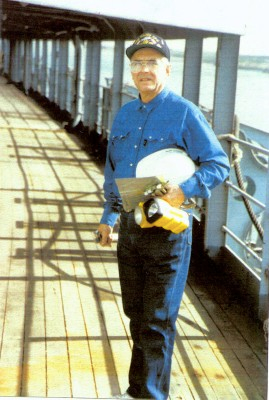 January 1996 before being cut up for salvage. 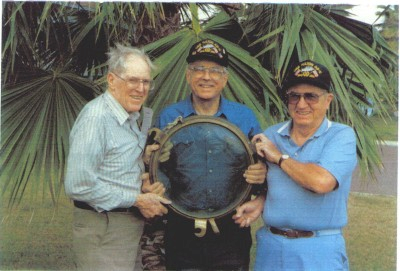 Glen W. Work, Emil A. Geffert, and Ches Laird holding the only surviving part of the ship. This porthole glass now resides in the Vallejo, Ca. museum. 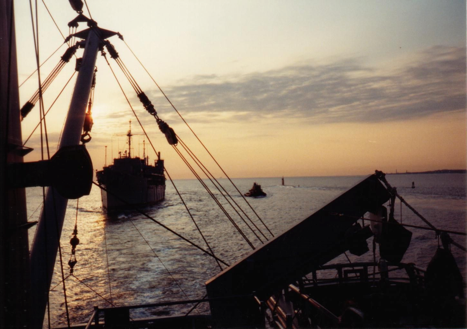 Emil Geffert, Portside looking aft at last berth in 1996. 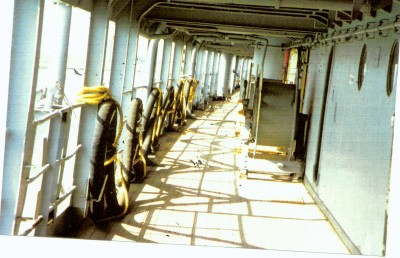 Starboard side looking aft 1996. 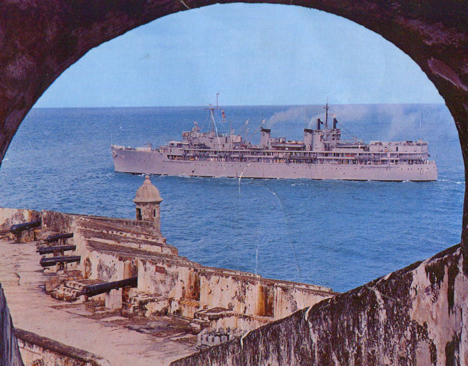 USS Fulton passing San Juan in the sixties. 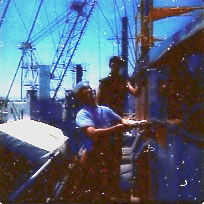 Shows RM3 Callahan chipping paint on the Signal Shack while in the yards at Charlestown, SC in 1971. 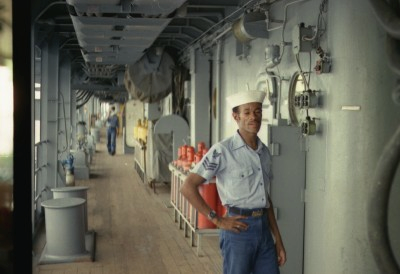 This view is starboard side looking aft. 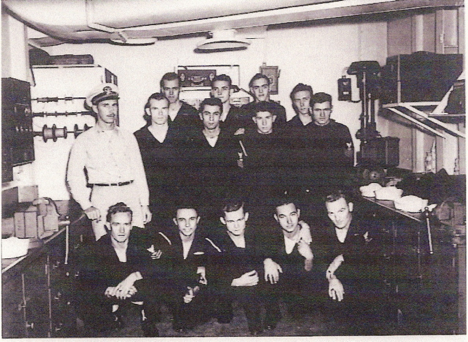 This is the radio repair group. 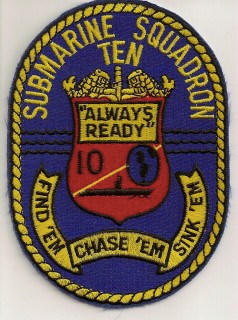 The radiomen and ET's of this division did the repair for the subs. 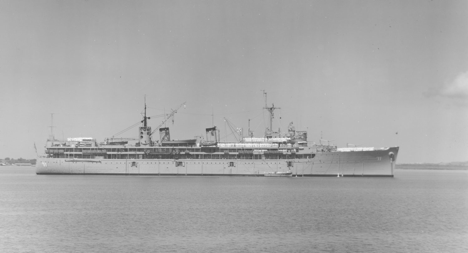 The ships operation division also had ET's and Radiomen for the Fulton only. 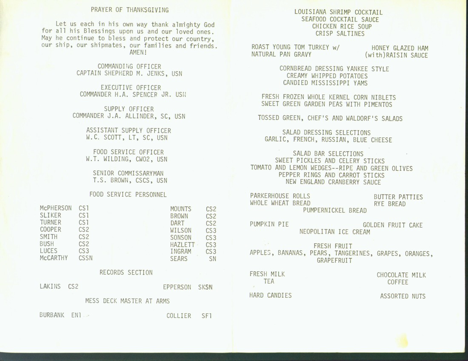 If the layout was the same when the webmaster was aboard this shop was located aft on the 02 level I believe. 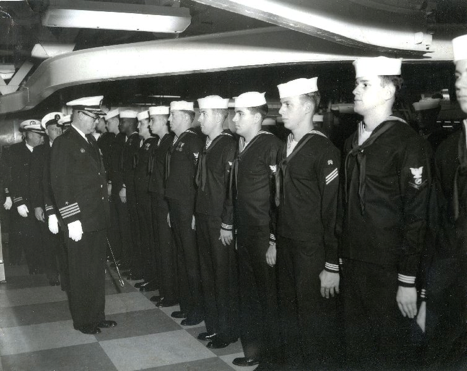 This picture was submitted by Ira W. Goodin who served aboard the Fulton during WW2. 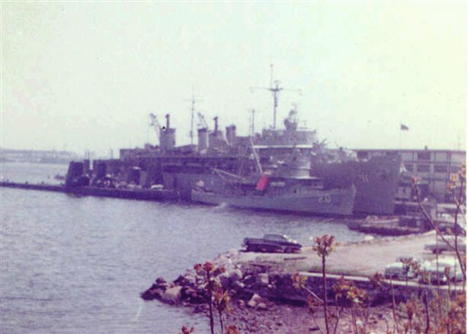 Picture of the USS Fulton being scrapped courtesy of Cliff Simonsen. 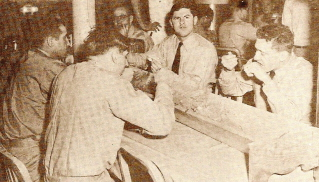 A new Chiefs initiation of eating from a trough in 1956. Pictured are: Bill J. Sego, TEC; Manfred C. Marotta, DCC; Bill W. Patrick, EMC; and Vincent Lanza, SKC. 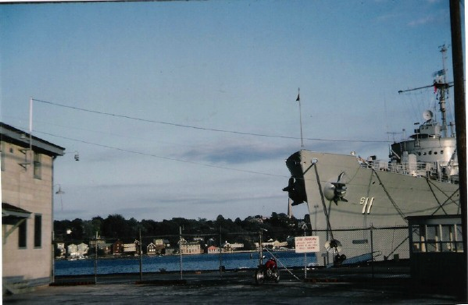 The following 4 pictures were sent in by Bill Kruzykowski. 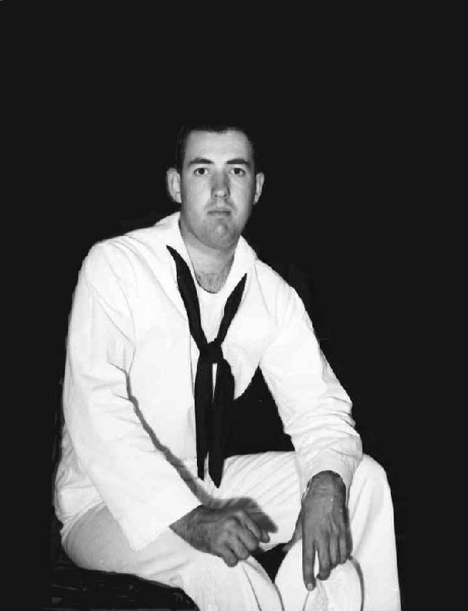 These pictures belonged to the late SH1 Simon Andrew Kruzykowski who served on the USS Fulton. 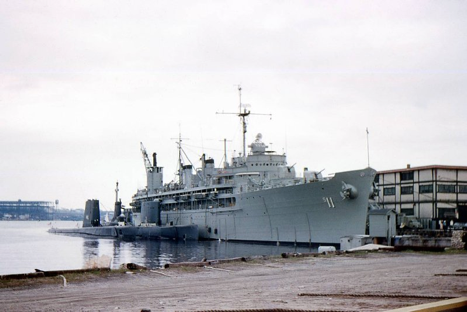 and did shore duty at the Brooklyn Navy Yard and at Correy Field, Naval Air Station Pensacola, FL. 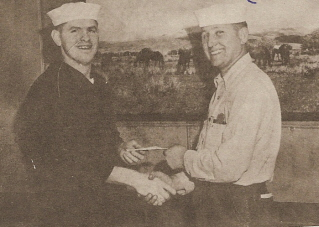 SH1 Kruzykowski served in the U.S. Army during WW2 before joining the Navy. 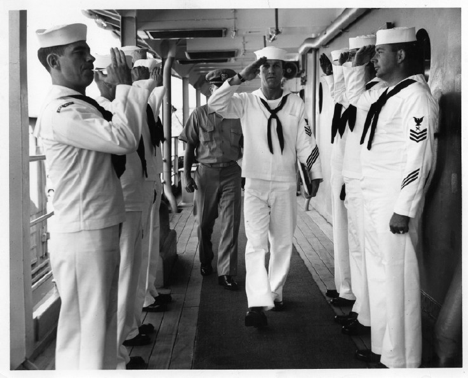 For those who don't know about the Ships Serviceman rate (SH) Ship's servicemen manage and operate shipboard retail and service activities. 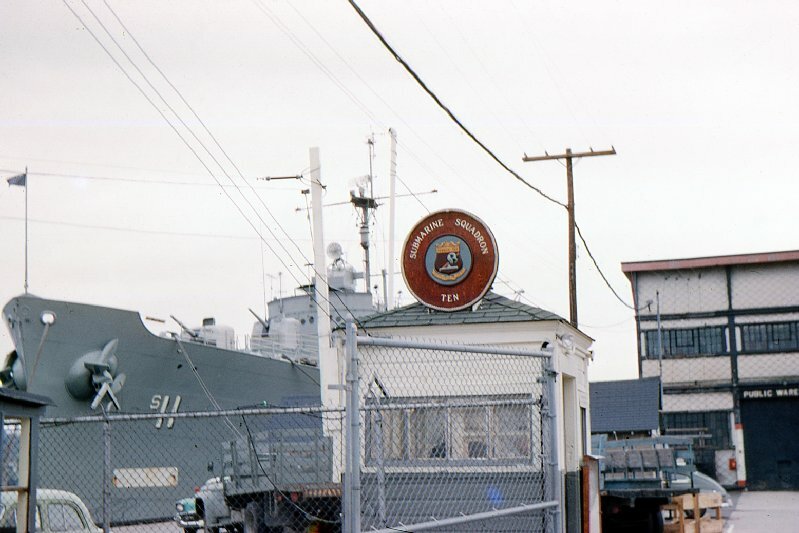 This includes ship's stores, vending machines and video games, barber shops, laundry and dry cleaning plants, and tailor shops. 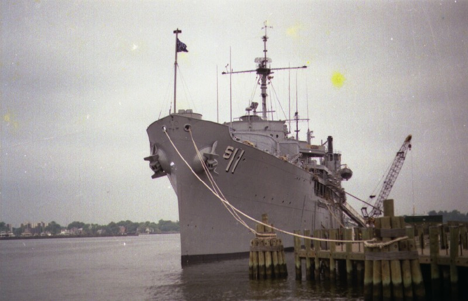 USS Fulton at the Weapon's Pier in Bayone, New Jersey, off loading weapons in preparation for the SRA in Norfolk VA sometime around Jan 87 or Jan 88. 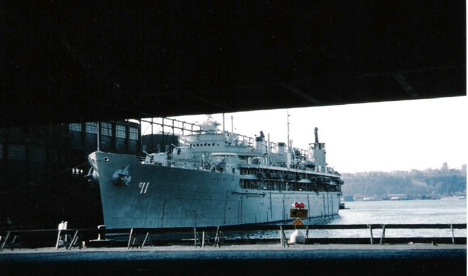 This is a picture of the USS Fulton pulling into Norfolk on October 1, 1991 Taken from the USS Grapple.